Although secondary prevention reduces the rates of recurrent heart attacks, it does nothing to prevent the larger burden of first attacks. It is worth highlighting a heart attack or sudden death is the first manifestation of CAD in half of all women and two-thirds of all men. It ignores the long-term cost-effective goal of preventing future high risk of CVD among the youth. Of course, this strategy will do little to reduce the long-term burden of chronic disease (see Primary Prevention). 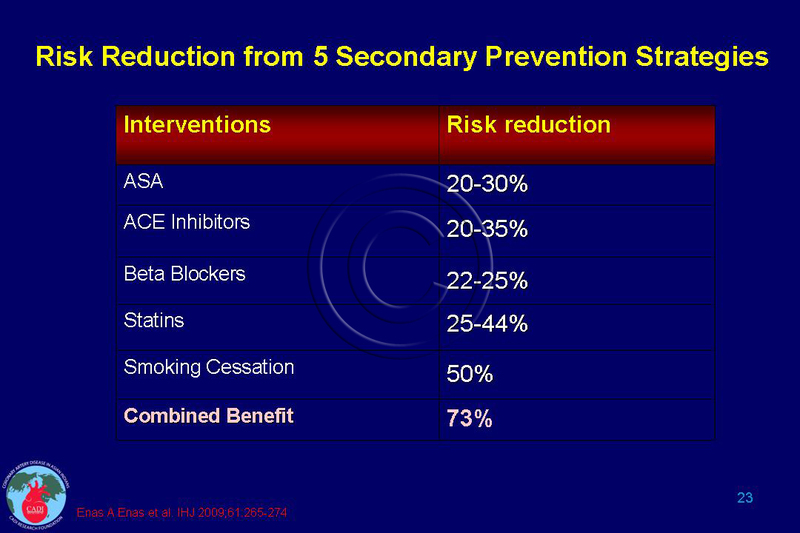 The extent of benefit that can be achieved with various secondary prevention strategies are given in Table 023. A recent study from Rajasthan has documented suboptimal prescription of evidence-based medication for people with CAD. The prescription of the 4-drug combination of aspirin, β-blockers, angiotensin-converting enzyme inhibitors, and statins by physicians at all three levels of health care ranged from 43% in tertiary care to 28% in secondary care and only 7% in primary care facilities.5 The underuse of life saving medications is rampant in India and contributes to unnecessary death and disability (see CAD India). This trial shows that coronary angioplasty/stent and bypass surgery does not provide significant additional long term benefit over and beyond that achieved with optimal lifestyle modifications and the use of recommended medications. Cardiologists throughout the world must display enough courage to implement the message of COURAGE Trial. For people with CAD, there was a significant decline in use of antiplatelet drugs, ACE inhibitors or ARBs, and statins, but not β blockers, with increasing number of years between the index event and time of assessment.8 . Some individuals may feel healthy several years after an acute CVD event or feel that they are at lower risk for an event (e.g., the young), contributing to a decline in their use with time.8 These findings also suggest a need to re-educate both doctors and their patients about the crucial role of medications in secondary prevention. Surprisingly, some very high risk groups (those with or both CAD and stroke) did not have a higher rate of use of drugs. This finding is consistent with other studies supporting the “inverse care law” (the sickest patients receiving the least care). For instance, 58% of individuals with CAD and 50% of individuals who had a stroke did not receive any of the four effective drug types; these rates were highest in the low-income countries.8 Substantial opportunities remain for enhancement of drug use, even in high-income countries. Yusuf S et al. Use of secondary prevention drugs for cardiovascular disease in the community in high-income, middle-income, and low-income countries (the PURE Study): a prospective epidemiological survey. Lancet. Aug 26 2011. The potential reasons for the global underutilization of secondary prevention medications is given in Table 128 A. As the use of secondary prevention medications is low worldwide—especially in low-income countries and rural areas—systematic approaches are needed to improve the long-term use of basic, inexpensive, and effective drugs.8 A major, systematic medical-pharmacological-media campaign should be mounted to reduce the rate of recurrent attacks by using all the recommended medications used in secondary prevention. 1. American Heart Association. Heart and Stroke Statistical Update2011. 2. Enas EA, Singh V, Munjal YP, Bhandari S, Yadave RD, Manchanda SC. Reducing the burden of coronary artery disease in India: challenges and opportunities. Indian Heart J. Mar-Apr 2008;60(2):161-175. 3. Enas EA, Singh V, Gupta R, Patel R, et al. 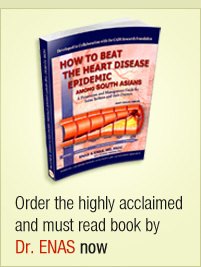 Recommendations of the Second Indo-US Health Summit for the prevention and control of cardiovascular disease among Asian Indians. Indian Heart J. 2009;61:265-74. 4. Kumar A, Fonarow GC, Eagle KA, et al. Regional and practice variation in adherence to guideline recommendations for secondary and primary prevention among outpatients with atherothrombosis or risk factors in the United States: a report from the REACH Registry. Crit Pathw Cardiol. Sep 2009;8(3):104-111. 5. Sharma KK, Gupta R, Agrawal A, et al. Low use of statins and other coronary secondary prevention therapies in primary and secondary care in India. Vasc Health Risk Manag. 2009;5:1007-1014.